The menu includes typical brunch dishes such as pancakes, breakfast toast, eggs and even entrees such as chicken marsala, pasta variations and any other special that the chef cooks up. Soft drinks and coffee are included and they're unlimited. If you'd like to get a morning cocktail such as a mimosa or a bloody Mary, you'll have to add a couple of bucks. I'd like to check it out soon and will let you know what I think. I don't think that the drinks are unlimited :( Sorry! Definitely never liked CUP much - the service was always horrible and the food was hit or miss, and mostly "miss" whenever I went there. The 32oz Bloody Mary's were, however, a marvel to be missed. 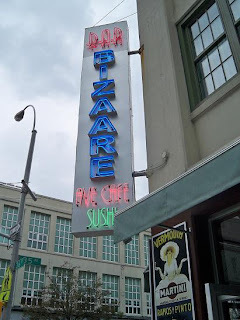 Looking forward to giving BizAAre a try! Ha ha - I hear ya. One way to find out - we gotta try it and then we'll judge.